In this short excerpt from a recent interview of Kylie and Kendall Jenner with A.J. Hammer on "Showbiz Tonight", their words say one thing and their body language says another. The body language is always right. They do not like their sister Kim Kardashian's partner Kanye West. Kylie Jenner says, "... he, he fits in great with the family. We like him a lot. He's very cool". In this image, Kylie Jenner looks down to her right just as she says, "...We like him a lot..." Ninety-five percent plus of right-handers look down to their right when they are experiencing or speaking about an emotional issue. She avoids eye contact with A.J. Hammer along with covering her right eye. A unilateral eye cover (or scratch or rub - all forms of Manipulators, Adaptors or Pacifiers) during a definitive statement or when answering a question is strongly suspicious for deception (covering both eyes has a completely different meaning). 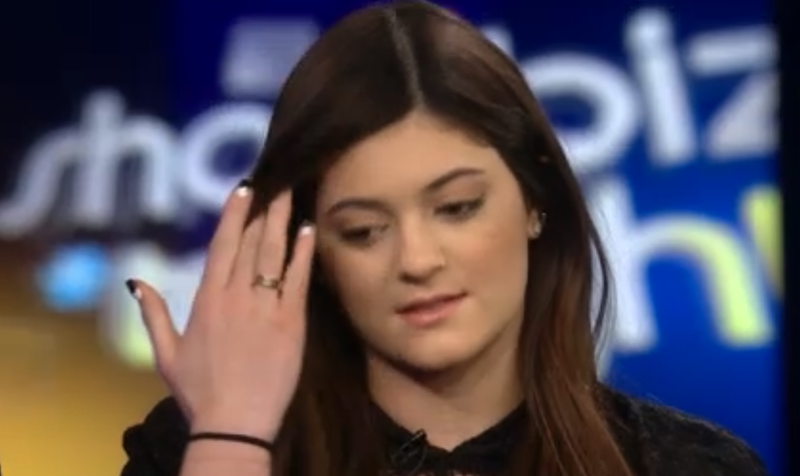 This nonverbal cluster along with her stuttering ("....he, he ....") are strong indicators that at least Kylie Jenner does not like Kanye West. Here Big sister Kendall says, "...Yep. He's a sweetheart...". Just after "Yep" and after "sweetheart", she purses her lips. Lip Pursing is a strong nonverbal signal that what is said and what is being felt are in disparity. Close up view of Kendall Jenner's lip pursing. Later in this video, Kylie Jenner again covers her right eye as she looks down to her right (this image is an instant after this covering). Eye contact will very often decrease at the moment of a lie - alternatively it may increase to unnatural staring. This is during her answer, "I mean of course, she's our sister and I want her to be happy and I know she doesn't (pause) she obviously wants to be divorced" (then a bilateral shoulder shrug). Interpretations of shrugs are difficult and fraught with double-negatives. There are obvious body language signals of anxiety here with a high probability of another deceptive statement. Could it be that Kim Kardashian doesn't want to be married to Kanye West? Or perhaps she still has some feelings for Kris Humphries? It is not possible to pin this down, but there is certainly significant anxiety being displayed by Kylie Jenner in this moment. Negotiation Body Language Secret # 335: What is the definition of "Eye Contact"? Nonverbal Communication Analysis # 2092: The Importance of Eye Contact - Contributing Author to "The Language Lab"?